Addresses the growing concern about journalism ethics in the United States and worldwide. Essays provide insights into the motivations, techniques, and challenges of journalists everywhere. 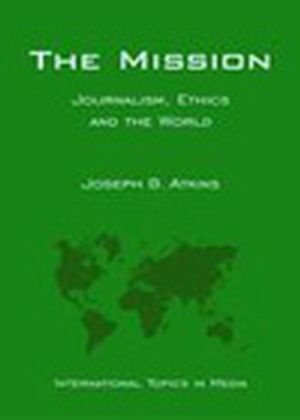 Joseph B. Atkins is the editor of The Mission: Journalism, Ethics and the World (International Topics in Media), published by Wiley. Chapter 1 Journalism as a Mission: Ethics and Purpose from an International Perspective. Chapter 2 Chaos and Order: Sacrificing the Individual for the Sake of Social Harmony. Part II In the United States and Latin America. Chapter 3 Ways of a Muckraker. Chapter 4 A Sinister Zone of Likeness: Journalists as Heroes and Villains in the U.S. South and in Central and Eastern Europe. Chapter 5 From Collusion to Independence: The Press, The Ruling Party, and Democratization in Mexico. Chapter 6 The Outspoken Journalist is an Expression, a Symbol of Colombia. Chapter 7 The Stranger: Minorities and Their Treatment in the German Media. Chapter 8 Between State Control and the Bottom Line: Journalism and Journalism Ethics in Hungary. Chapter 9 SITA: Slovakia's First Independent News Service and Its Battles with the Huey Long of the Danube. Chapter 10 Holding Politicians' Feet to the Fire in Slovenia. Part IV In the Middle East and Africa. Chapter 11 Lebanese Television: Caught Between the Government and the Private Sector. Chapter 12 Press Freedom and the Crisis of Ethical Journalism in Southern Africa. Chapter 13 Nigerian Press Ethics and the Politics of Pluralism. Part V In South and East Asia. Chapter 14 The Indian Press: Covering an Enigma. Chapter 15 Palace Intrigue in Katmandu and the Press in Nepal. Chapter 16 The Press in Japan: Job Security versus Journalistic Mission. Part VI Three Journalists and Their Missions. Chapter 17 A Journey in Journalism: From Idealism to Bankruptcy. Chapter 18 Reclaiming Responsibility: A Journalist and Artist in the Catholic Worker Movement. Chapter 19 Ryszard Kapuscinski: The Empathetic Existentialist. Postscript: The White Rose: On the Martyrdom of Student Pamphleteers in Nazi Germany and Their Legacy.